You’re only weeks away from an A-race. You’re in a solid groove following several strong training sessions. You despise the wave of anxiety that comes over you when you’re sitting still, and want nothing more than to pound the pavement. You’re just like me. It’s that time of the week again: the dreaded rest day. We all know that rest days are crucial to mental and physical recovery, but why do we resist taking them? To me, taking a rest day with the intention of improving fitness is akin to eating frequently throughout the day to lose weight: counterintuitive, and seemingly counterproductive. When I put it in perspective, I know that missing a night of sleep will set me back, so why should I skimp on active rest? 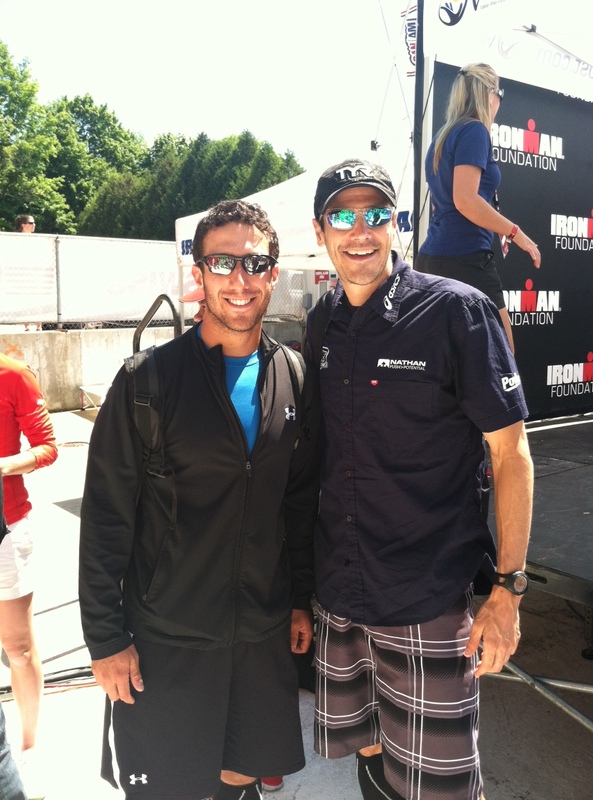 Enjoying a rest day before Ironman Lake Placid with the 2012 champion – Andy Potts. When I trained for my past two A-races, Ironman Lake Placid and the San Francisco marathon, I instated a day of nothing each week- not even light swimming, and was rewarded with significant gains in every discipline. I spent my off day relaxing and recovering: lots of stretching, nutritious meals, controlled portions of treats, and episodes of Law & Order: SVU until my eyes hurt. My body responded well, and a small break from the norm served as a mental reset; I couldn’t wait to lace up my shoes the following day. Despite the long hours often required for distance races, I opt for quality, high intensity sessions over extraneous volume. These sessions can leave me feeling run-down, and rest has become a vital part of my training method. Fatigue is my body’s way of telling me that it’s time to take my foot off the gas. If one rest day per week isn’t enough, I listen to my body and take another, remembering that training plans are a suggestion – not a mandate. Have you taken a rest day this week? If not, I recommend stocking up on Halloween candy and firing up Hulu Plus: Law & Order SVU Season 15 starts on September 25th. I am five weeks away from my ‘a’ race and really trying to stick to my plan. I hear you on the rest and as I am two weeks into my plan my body is screaming for rest, but that is built into the plan.Good post. Thanks! Are you training for another triathlon now? There’s no harm in moving workouts around (I particularly like to swap swimming for running) when your body begs for mercy. Good luck and happy training!